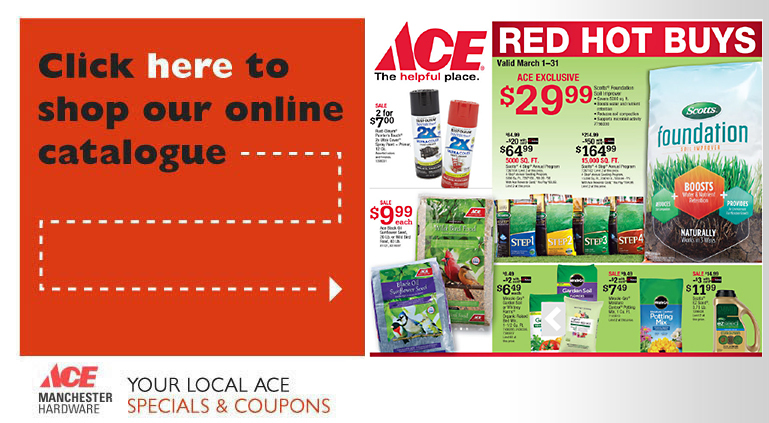 Manchester ACE Hardware | York's hardware and home improvement specialists! Going to Ace is like going to your neighbor! Have a job to do but not the proper tools? Come see all our rentals! we’re your lumber one-stop shop! We’ve got the right tools for any job! Closet need some help? We carry Rubbermaid shelving and organizer bins. Get in. Get help. Get on with your weekend! Because you’ve got more to do than wander the halls of big box stores trying to find the help you need and the right materials for your home improvement project. Take back your weekends! We have the knowledge to help… and a smile to see you on your way. ACE is the place for you and your home. Now selling large propane tanks for your home heating needs, we also fill the small tanks you use for grilling and heating. Proper maintenance is key to keeping your power equipment running. And when you need repairs or new equipment... look to the pros at ACE. Chain saws, post hole diggers, lawn aerators, pressure washers, drain augers, tractors, ladders, popcorn poppers... and so much more. Equipment rental to meet your needs!